We've braved the dark of night, howling snowstorms and sub-zero conditions to bring you the story of Northshore Mining Railroad: The Little Giant! Formed out of the original Reserve Mining Railroad, this is the little railroad that could, did, and does in a big way! 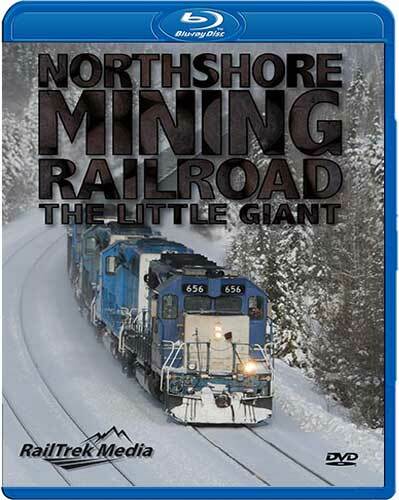 Explore the operations of this railroad with a look at the facilities in Silver Bay, rotary dumping activities, and endless parade of EMD power! Searail (Brooklyn NY US) on 2016-04-29 08:43:31. A great video of a unique operation. Well filmed and narrated. This isn't videography, it's cinematography. One of my favorite videos! MP_37 (Southeastern US) on 2016-02-09 01:18:50. I've heard of the Northshore Mining RR but when visiting the general area I couldn't explore it due to limited time and a main focus of the remaining DM&IR and the Erie Mining RR operations. It always intrigued me; the existence of a double track heavy RR that was so isolated and more or less "below the radar". Based on the previews and reviews, I bought this video. For a video on a 47 mile railroad with the vast majority of trains of ore hoppers, the producers did an excellent job in showing it off, all the more so given the isolation and limited access to the right-of-way. Videography/Camera work is first rate. This was BTW my first Blu-Ray RR video and I was blown away by the clarity. The blue/white EMD SD-40-2s look and sound great The operations were subdivided into several subsections, which provided variety. The night scenes during winter were awesome: Some of them looked so surreal as to be nearly science-fiction-y with the glowing snow drifts lit by the train and the red crossing signals. Nice wrap-up at the end with an old non-turbocharged SD-18 leading an uphill train during winter. Great sights and sounds during the chase up the hill. Very happy with this video. Papa Choo Choo (Tinley Park IL US) on 2016-04-27 13:51:34. Interesting content video however the Blu-ray image quality was not up to the standards of some others. In many instances it looked like DVD quality. I viewed it on a 70 inch HD and it was very obvious. run8anderson (Basking Ridge NJ) on 2016-01-25 09:15:33. Are you tired of endless BNSF & UP intermodal trains? Are you an EMD fan? Do you like SD40's in full dynamic w/ 17,000 tons of ore behind them or in Run8 slogging up a grade? Then this program is for you. I really liked the uniqueness of this "little" RR. Thoroughly researched & wonderful narrated. Also included is a look at the processing plant & ore dock. This quickly went out of stock, so I had to wait for a bit. Well worth the wait. Charley Mann (Little Mountain, South Carolina) on 2016-01-05 18:25:09. Very interesting program. Features Mostly SD40's with a SD28-3 and a section showing SD18 1231 on the point of a empty train. Beautiful scenery, with lots of snow and some fall colors. Also, very informative on their operations. Very worthwhile production. dmacleo (Etna, Maine) on 2015-11-21 13:43:02. A pretty informative video. well researched and the bluray has some pretty nice scenery.